The Godwin Dri-Prime 6" x 4" (150mm x 100mm) HL5MS automatic priming centrifugal pump is a compact, high pressure pump perfectly suited for temporary pumping under discharge pressure conditions or high discharge lifts. Capable of generating maximum flows of 1000 gallons per minute (63 l/sec.) and discharge heads to 455 feet (138.7M) or 195 psi (13.4 BAR), the HL5MS is used in temporary fire service, quarry and mine dewatering, and as a temporary replacement for permanently installed transfer pumps. Like all Godwin Dri-Prime pumps, the HL5MS can prime and reprime automatically from dry to 28 feet (8.5M) of suction lift. Open full description in this PDF. • Fully automatic priming from dry to 28 feet (8.5M) of suction lift. Maximum heads to 455 feet (138.7M), maximum flows to 1000 gpm (63 l/sec.). 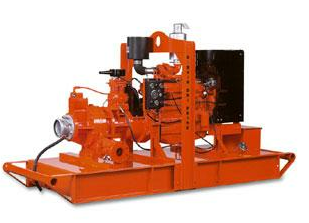 • Pumpend available in cast iron, stainless steel and other hardened materials. • Extensive application flexibility — will handle sludge with solids up to 1-3/8" (35mm) in diameter. • Continuously operated “Godwin” venturi air ejector priming device featuring direct drive air compressor requiring no form of periodic adjustment or control. • Dry running, oil-lubricated, mechanical seal with abrasion resistant silicon carbide interfaces. • Solids handling swing-type Non Return valve with renewable flexible rubber seat. • Compact unit mounted on a heavy-duty skid base or twin axle highway trailer both incorporating integral overnight running fuel tank and lifting frame. • Simple maintenance — normally limited to checking engine and seal cavity oil levels. • Standard John Deere 6068T or Caterpillar 3056TA engine. Also available with other diesel engines or electric drive motor. • Low-profile side discharge for easy pipe connection.